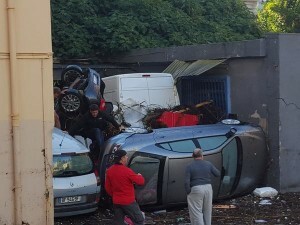 In October 2015, Cannes suffered absolutely devastating damage as deadly floods ravaged the south-east of France. The scale of the catastrophe was unprecedented, with 16 deaths and between 550-650 million euros of damage. Although large sums were provided to deal with the aftermath – including EUR10 million from the PACA region and €100,000 from the French football federation – ordinary people and businesses still suffered immensely either in direct losses or the losses due to the clean-up and disruption to business. The Mayor of Cannes, David Lisnard, launched an appeal to the many people that partly live off Cannes without living there, asking for their financial help. At a press conference covered by the Nice Matin newspaper, Lisnard reveal that a total of 920 000 euros had been collected. Among the 236 donors, Monica Bellucci (photo) and Gilles Jacob were particularly generous as they gave €10,000 each. Other sponsors include the wife of a head of state who asked to remain anonymous (100,000 euros) and the Majestic Barrière hotel (200,000 euros). An art auction was also organised to raise further funds. Lisnard also revealed that the Palais is continuing its ongoing renovation, with another €20 million slated for upgrades. “We must continue to evolve the Palace to meet the expectations of the Festival de Cannes and the Cannes Lions advertising Festival,” he told Nice Matin. The temporary rooftop projection room called the salle du soixantième will be replaced by a permanent new room integrated into the main building. He stressed that the cost would not be borne by local tax-payers, as the Palais is looking for sponsors to associate their name with the project.